Posted: Thu Sep 19, 2013 5:47 pm Post subject: Re: Guys, RUOK? Yes on all accounts sans rentals, Suz, thank you. Just finished up a belt service on an Arctic Cat Prowler xtz 1000. Awesome rig. New hunting license soon, birds are gona plop in the pot quilck here. (regardless of what you think, BUSHY). "Elvira"'s in the safe getn' all a twitterpated. Lunch time at my mountain work shop....with a view. Killer deli right THERE. *chomp burp! * Aint thought of LaLa Land once. Seems a million miles away. Making 1/4 what I used to, busier than I've ever been in my life, feels right here for sure. Elk come down every night and bugle. Gona get some sheds after the season too for my wall. I'm home again. Posted: Thu Sep 19, 2013 6:34 pm Post subject: Re: Guys, RUOK? Most of ya know I'm pretty country. I'm also camped at my shop during the week if it's busy. It's plenty big enuf and my office doubles as my quarters. Only thing missing is a shower. So I made one from Home Depot parts, even has a shower caddy in it. 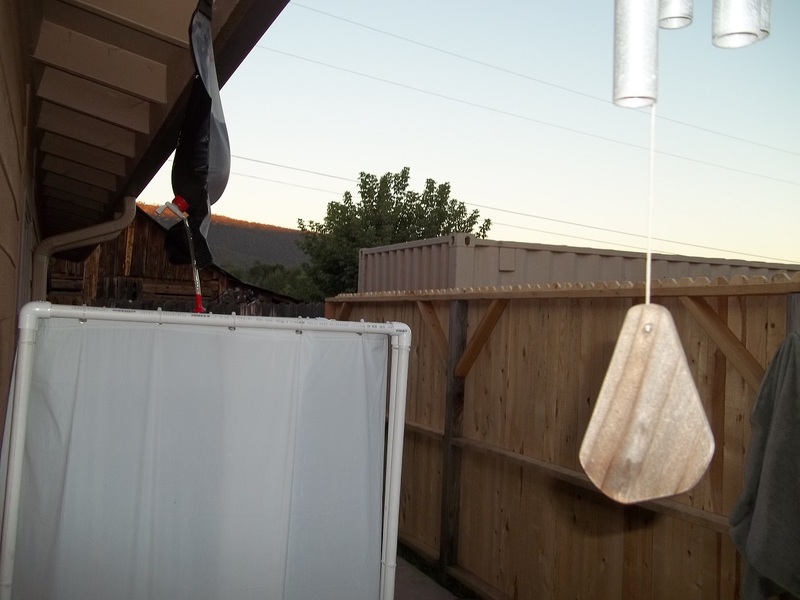 Got a great southern view in a large, private back patio and doves come to roost from all over. I could shower n shoot! Barn next door to the East is circa 1890. No one for miles in either direction. Come soon I'm gona need to rethink the shower thing with real plumbing out there. I kinda like it this way it's old school. But come winter? Brrr! Gona need a LOT of hot running water to keep from sticking to things. Posted: Fri Sep 20, 2013 9:01 am Post subject: Re: Guys, RUOK? Shoes??!!?? WRONG!! 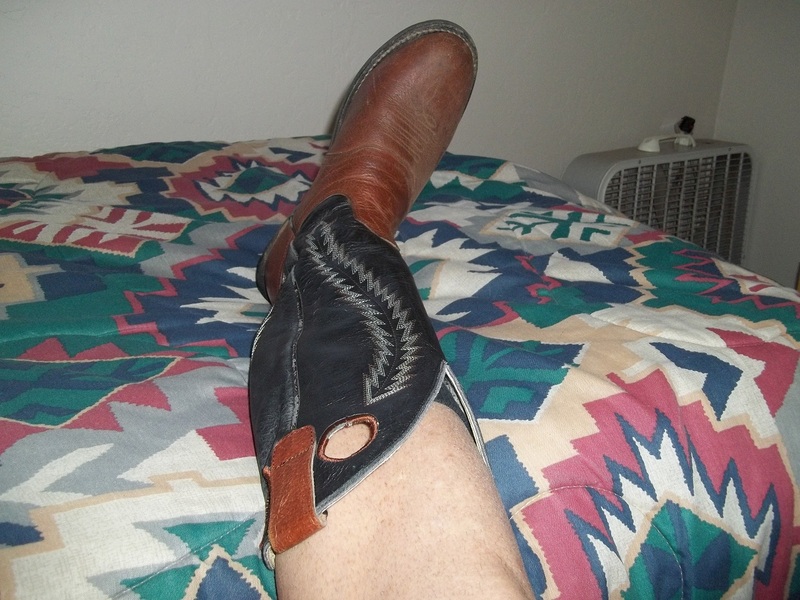 In so many ways.. Yer in Arizona now...Dress right. Posted: Fri Sep 20, 2013 9:33 am Post subject: Re: Guys, RUOK? Them's is shop shoes. I'm a professional. They don't come in the house cuz they get nasty. Sides....proly scare the clients away wearing short's and my Buckaroo's. There just aint no pleasing grouchy old people. Posted: Fri Sep 20, 2013 11:03 am Post subject: Re: Guys, RUOK? Hummm...Looks like you need to shave them legs again. The stubble is showing. Posted: Fri Sep 20, 2013 12:05 pm Post subject: Re: Guys, RUOK? Stovie it looks like you are living the dream mate. see if you can find a wee watering can you can nab the sprinkler off and plumb it up to a 20 litre/4 gal drum like a drench container with garden hose fittings..the drench drums have a threaded hole down low to poke a tap in. Posted: Fri Sep 20, 2013 4:08 pm Post subject: Re: Guys, RUOK? Bushy- shaved legs. Chicks dig it. El V! We think alike a lot! Nail on the head mate. This was just a quicky thingy...but you got it. Posted: Fri Sep 20, 2013 6:33 pm Post subject: Re: Guys, RUOK? A customer came in, he's a funny guy, said "hey, yer good at fixin stuff...see if you can fix the loose fixture at the top". Posted: Fri Sep 20, 2013 6:44 pm Post subject: Re: Guys, RUOK? Hell of a way to hide your home defence weapon. Better check the chamber first before ya go to fixin' that. Posted: Fri Sep 20, 2013 6:51 pm Post subject: Re: Guys, RUOK? ...and double-check it before ya turn it on! Posted: Fri Sep 20, 2013 8:27 pm Post subject: Re: Guys, RUOK? Posted: Fri Sep 20, 2013 8:31 pm Post subject: Re: Guys, RUOK? Posted: Fri Sep 20, 2013 10:14 pm Post subject: Re: Guys, RUOK? watch out or Suz will try to rob it for parts!!!! thats a mosin garant if Im not mistaken. Posted: Sat Sep 21, 2013 7:25 am Post subject: Re: Guys, RUOK? 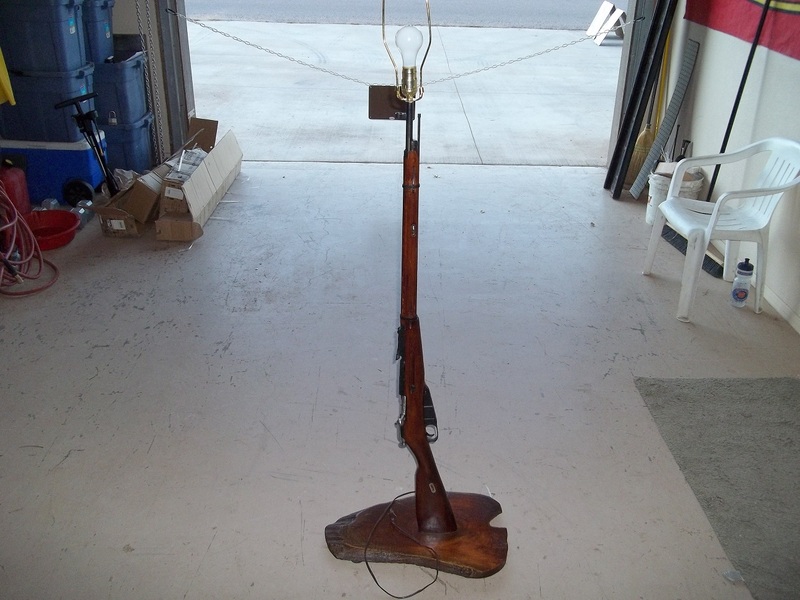 Mosin Nagant Elvis...yeah i have one, I wouldn't do that to it but as they are so cheap to buy you could easily equip an entire room full of lamps, table legs might make a good baseball bat? You should weld that lamp thingy on there, that'd show him. Posted: Sat Sep 21, 2013 7:34 am Post subject: Re: Guys, RUOK? Big 5 sells them for 90$. Some are a in nice shape. And the shoot boy. I pulled the bolt last night and, it's still operable. WTF? So I'm yanking the pin before I give it back. Also gona rig up a snapper-popper so when he turns it on... *pak! *.